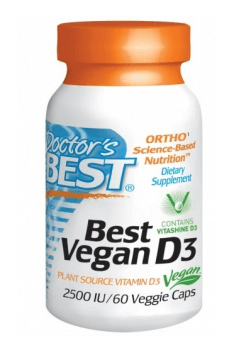 Vegan D3 2500IU 60 caps. Take 1 capsule, up to twice a day, preferably with food. Vitamin D is characterized by long half-life and it is stored in the organism, therefore it is best to take the recommended dose e.g. every second day or (in higher doses) even once a week. However, it is most effective to supplement vitamin D according to its level in blood. Vitamin D is a compound soluble in fats, therefore in order to ensure the best absorption, it should be taken with a meal containing fat.